A few weeks ago I announced that I am spearheading the coordination of PossibleNOW’s 2013 Customer Engagement Marketing Summit. The first task at hand was our call for speakers and I am thoroughly pleased with the submissions that we have received so far. Our Call for Speakers has elicited responses from global brands and thought leaders in a wide variety of industries — all of whom are prepared to share strategies and case studies. But there’s still time to submit entries! We’re looking for thought leaders and marketing gurus from global brands who can energize and engage the attendees at our 2013 CEM Summit. We expect this year’s event to attract marketing and customer service professionals and executives who are involved in customer engagement, mobile marketing, social media marketing, customer loyalty and retention, and other facets of direct marketing. If you are a dynamic speaker who can provide actionable advice to marketing and customer engagement professionals, send your proposals my way at cemsummit@possiblenow.com. 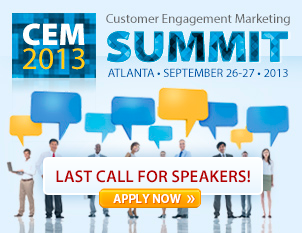 To learn more about opportunities for speaking at the 2013 CEM Summit or to submit an application, visit http://www.cemsummit2013.com. The deadline to submit speaking proposals is April 30, 2013. PossibleNOW will announce the speaker lineup in mid-May.